Heritage conservation – why; how; by whom; for whom? I came across this article on Best Practices to Strengthen Your Organization with Volunteers last weekend when it was retweeted by a UK-based heritage volunteering account I follow on Twitter. While I realise that a retweet does not necessarily indicate an endorsement, I find a number of the so-called ‘best practices’ troubling in a heritage context, with regard to questions of exploiting volunteers and devaluing professionals during austerity. For me, what makes this especially important, is the fact that volunteering is often linked to progressive ideals and commitments to human rights, such as that everyone should be given the opportunity to be involved in identifying and looking after their heritage. The question then becomes whether we, in the heritage sector, are promoting volunteering in an effort to save money and make heritage non-profits financially sustainable, or to encourage people to connect with their heritage and develop agency for its identification and care. So this article is concerned with saving money. Fair enough, but surely this should still be done without exploiting volunteers or devaluing professionals? This is where we get closer to the difficult issues of volunteering in the heritage sector. On Twitter, archaeologists use the hashtag #freearchaeology to highlight and shame organisations that advertise unpaid jobs. A volunteer position is not a job. Full-time jobs in the heritage sector being advertised as volunteer positions devalues professionals and exploits volunteers. The heritage sector is notorious for its lack of diversity, with professional archaeologists in the UK at 99% white and conservators 98% in 2013. If unpaid work is necessary to gain relevant experience and experience is required to get paid work, then entering the sector is only possible for those who can afford to risk having to work for free; heritage volunteering cannot wash its hands of its role in this. At least in this case it is clear that volunteers are being “empowered” to share your message – but this is an article of top tips for volunteer managers, not a call for volunteers, so the transparency is perhaps not that surprising. What am I doing, exactly – or, why am I doing what I’m doing? Unfortunately, the meeting with my partners scheduled for last weekend had to be postponed. In the meantime, I thought I would reflect on the final prep meeting I had with Jo last Friday. I mentioned that I wanted to spend time sharing what I had learned about wire-framing and paper prototyping with my partners, so they could take on the role I have taken on in the future – pretending to be a designer. Jo was immediately suspicious. Why would I want my users to become designers; by taking on the role of designers, they would lose value as representative users. I explained that part of my reason for choosing to try collaborative design in the first place was to test its “transformative” potential. While I hope the digital tools we design together will be useful and facilitate sustainability, I’m primarily interested in the process of collaborative design and how everyone participating is changed through the process – changed in ways that facilitate sustainability. Jo then pointed out that he is uncomfortable with the idea that sustainability comes from changing people, which sent me back to thinking about the incumbent and critical democracies I blogged about a few weeks ago. Am I back to the form of capacity building where I am teaching people to work in the ways I think they should work, rather than providing support; am I talking about my work in the form of “critical democracy” while practising a form of “incumbent democracy” where I’m co-opting local voluntary initiative to suit professional and academic priorities? Am I claiming to empower my partner groups, while actually just manipulating them to do professional work for free? It is fair to say that I chose to use co-design before I discovered Blaug’s critical and incumbent democracies and took a further critical look at my project. While I re-evaluated my research aims and revisited what I’m using as my data, I didn’t really step fully back from my research and reconsider my overarching methodologies. Similarly, while I’m focusing on the process of struggling to enact my own critical and reflexive practice, I remain tasked with studying the sustainability of community groups involved in taking care of local heritage. I also remain committed to studying how sustainability can be facilitated, rather than simply assessing sustainability. So I am torn – I’m critical of projects that set out to meet their own needs by changing others – yet that is what my project is. Unless, sustainability and facilitating sustainability is a shared need. If my partner groups are interested in what makes groups like theirs more effective and sustainable, and want to work with me to facilitate sustainability in their groups and others – then maybe I am involved in engineering critical democracy after all? For me, power is the key – only by sharing power is empowerment possible. This is why I am not interested in forming networks through the Council for British Archaeology that they (or I) hold power over, but to use our resources to help set up networks that can empower. Part of the reason why sharing power is difficult is that we may not see ourselves as having power, and others may not mind us having it or exercising it – it may even be welcomed and encouraged. Sharing power may sometimes involve refusing or declining power. In my case, these reflections have reminded me that my research isn’t about digital tools or co-design. I must be willing to scrap the idea for the digital tool we are working on that I pitched at the start of the project. I must be willing to move away from the idea of using co-design and digital tools that I pitched at the start of the project. At the very least, I must be willing to give up on these ideas if I am going to claim to be promoting critical rather than incumbent democracy. My research isn’t about any individual digital tool. It’s not about digital tools. It’s not about co-design. It’s about facilitating sustainability in community groups and it’s about community groups facilitating their own sustainability. It’s about supporting something I can walk away from two years from now. Why am I so set on having myself and my ideas at the centre of it all? Renegotiating roles and responsibilities is becoming the very core of my research – I have recently decided to focus more on why it is difficult to re-position myself as a heritage practitioner when I do collaborative work. I think this has a lot to do with my perceptions of expertise: my own expertise and the expertise of those I work with. I am a trained archaeologist, objects conservator and heritage manager – though I don’t know that I am entirely comfortable in any of those identities. I am very clear on what I am not, though; I am not a web designer or a digital specialist. I have chosen to use digital design in my research because I believe it can be used to build infrastructure that can facilitate sustainability in community groups who want to take care of heritage and because it is an area where collaborative approaches are well-developed. Together with my research partners, I am designing digital tools that we think will be useful. Despite this, I have been very clear from the beginning that while I am reading up on collaborative design, I am not, and never will be, a designer. I wanted to use collaborative design to give my partners a sense of ownership over the digital products we come up with together and to make sure that we end up with something useful, but at some point in the design process I always thought we would hand things over to a digital specialist. This is still the case, but I have repeatedly been encouraged to go further in the design process before handing it over to someone outside the project. 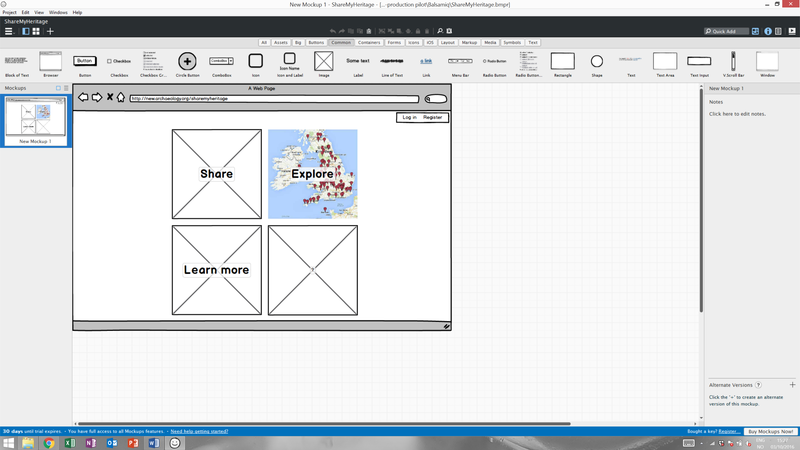 As a result, I found myself downloading Balsamiq (a wireframing software) this morning, and am now beginning to do some mock-ups that will be used as a tool to drive creative discussions with my partners at the end of next week. Essentially, I am doing web design. Conservation professionals who want to involve others in caring for heritage are sometimes frustrated by people’s reluctance to get involved, and being told “you’re the expert”. While there obviously are tasks that should be reserved for specialists, whether in conservation or in web design, resisting the urge to say “I’m not a conservator” or “I’m not a web designer” and taking the plunge can be really rewarding. What I think we really need is a better understanding of “expertise” and what it takes to perform tasks that are unfamiliar – so we know what we can try and when we should ask for help. You might just be surprised how much you can actually do yourself and how much that knowledge changes how you view yourself and others. Ultimately, as our perceptions change, I hope we change how we work together. Do we really want more volunteers in public services?